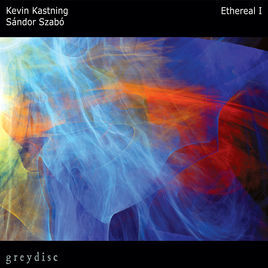 Review: "Kastning, Kevin/Sandor Szabo: Ethereal I" - Sea of Tranquility - The Web Destination for Progressive Music! Constantly at work, Kevin Kastning returns with one of his many collaborators - guitarist Sándor Szabó - the pair having recorded eight albums together since 2007’s Resonance. Kastning is the creator of the 36-string double contra-guitar, 30 string contra-alto guitar, 15 string extended classical and other forms of the guitar which are different from the expected. On Ethereal I it is the first two of those inventions that are brought into play alongside piano, while Szabó adds standard and baritone electric guitars to the mix. Through the very nature of the instruments he has formed, Kastning’s music is often avant-garde, remote and unexpected. However with Szabó as co-composer and performer, Ethereal I is ever so slightly more song based than might have been anticipated. The opening “Choros Nympharum” is an imposing beast, deep in contemplation, yet still pensive and reserved. As ever with Kastning, the idea never seems to be to flood the listener with notes, but instead to create space for the music to flow into and out of; something which “The Leaves Are Full Of Voices” also takes into consideration. With piano creating a sparse backdrop, there’s a lighter feel added to the intentional gloom of what Kastning and Szabó specialise in, the hugely patient mannerisms of this style always at the forefront and challenging the listener to stay the course. However, as an opening pair, they do form a much more ready welcome than some of their previous work. Things level out and meet expectations a little more straight forwardly on “And In Water”, an enigmatic approach of slowly tumbling notes played out over an off kilter melody. While “Spoken By The Wind” is a bending of sounds which suggests the power that a gentle breeze can become in almost a matter of seconds; a foreboding nature laying hidden just underneath what is a playful dance. “Moves Only Now And Clinging” proves as tough to break down as the name suggests, an intentionally arm’s length approach adopted, before the circle is completed through the closing “Sylva Nympharum”. An extension of the album’s opening piece rolled out across nine minutes of patient atmosphere building, which in many ways sums up everything you can expect to find on Ethereal I. That Kevin Kastning genuinely resides in a niche that few else have discovered marks him out as a truly individual talent. As a rule however, I do tend to engage with his collaborations more than his solo work, even if they are always clearly linked. The same applies here, as Sándor Szabó helps to find a more obvious way in to what can be an impenetrable intention.